Pedro Casciaro was one of the earliest members of Opus Dei, the Catholic organization founded by St. Josemaria Escriva in 1928. Casciaro joined Opus Dei in 1935 at the age of 20. He lived beside the founder during the difficult years of the Spanish Civil War and was ordained in 1946. He had become one of St. Josemaria's most trusted aides in the worldwide development of Opus Dei. In this book Fr. Casciaro reveals for the first time his personal recollections of Opus Dei's founder, which span a period of forty years. "He brings us a vivid narrative, written with a tremendous sense of humor which highlights our founder's human and supernatural traits," commented Bishop Javier Echevarria, the Prelate of Opus Dei. "As can readily be imagined, these pages are invaluable." 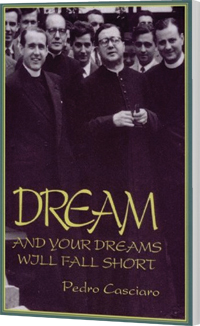 When Pedro Casciaro died in Mexico in 1995, he realized he had been able to savor the truth encapsulated in those words St. Josemaria had whispered to him some sixty years earlier: "Dream, and your dreams will fall short..."